Egyptian shot-making sensation Raneem El Welily moved into the quarter-finals of the 2017 Carol Weymuller Open as seeded players in Brooklyn made it four wins out of four on the second day of main draw action. 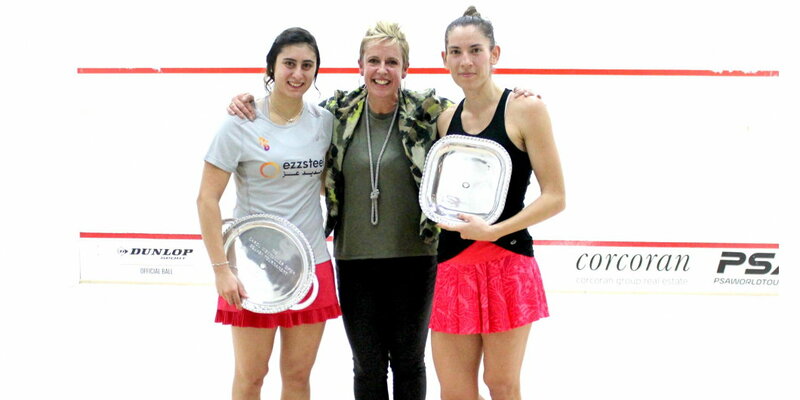 Inside the Heights Casino, 2011 champion El Welily played with patience and precision against India’s Dipika Pallikal Karthik to claim a 12th successive win over the World No.21 by an 11-8, 11-6, 11-7 margin. El Welily, who was a losing finalist in last week’s U.S. Open, will take on England’s World No.15 Victoria Lust in the next round after Lust dispatched tournament wildcard Emilia Sioni in straight games. “I was trying to set my attitude right, after the big tournament last week I have to reset my mentality,” said World No.3 El Welily. The in-form Joelle King continued her strong start to the 2017/18 season after the 2015 runner-up downed Millie Tomlinson by a 3-0 scoreline. King, who reached her first World Series semi-final in over three years at the U.S. Open dominated the ’T’ in the opening two games to take them 11-7, 11-5 and she prevailed in a third-game tie-break to seal the win after Tomlinson had fought back from 7-2 down. ”I thought I started pretty well,” King said. “I felt I was playing my games and had a good start. Then she came back strong towards the end of the first. I relaxed a little and before I knew it, it was tight. I started getting a bit frustrated but managed to win that one. The day’s other match saw Hong Kong’s Annie Au beat Belgian qualifier Nele Gilis and she will take on King for a place in the last four.